Batiz and his Christianity in the Middle East class with Greek Orthodox Patriarch Theophilos III in Old City Jerusalem. 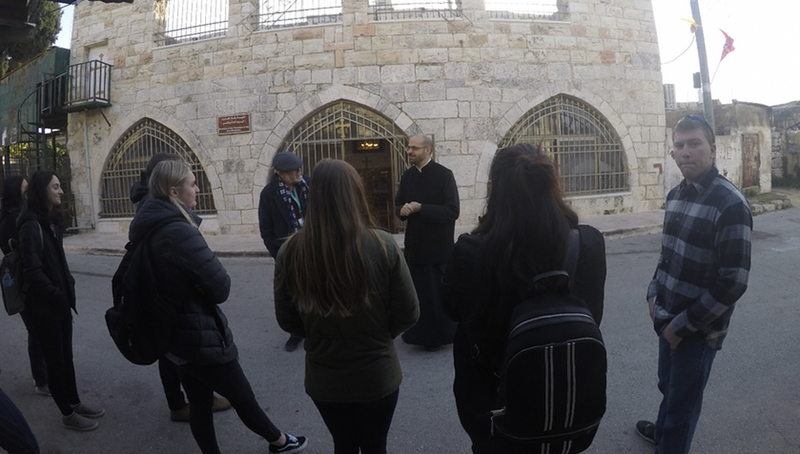 The course I took was Christianity in the Middle East, which involved a 10-day trip to Israel to not only see the many famous churches and monasteries of the Holy Land but to also learn about and interact with the “Living Stones” of the land. These “Living Stones” are the native inhabitants of the Holy Land tracing their lineages back centuries or more. Since the course is called Christianity in the Middle East, the “Living Stones” we focused on were Christians living in the Middle East, more specifically Palestinian Christians. From them, we learned of their history and plight under the current occupation they face by Israelis. The TL;DR of my study abroad experience was it was a lot of bitter with a little bit of sweet, but ultimately rewarding. If you’re looking for a trip with beautiful sights and where you are neither confused or miserable nearly daily over the treatment of others, don’t take Christianity in the Middle East. You do get plenty of beautiful sights whether you be looking out into a centuries-old church or looking out into the Judean wilderness, but you also get with it the stories of people trying to make the best of a bad situation. To a small extent you also get a chance to walk in the footsteps of these people by walking down the streets of once bustling cities, walk through checkpoints and along the separation wall. 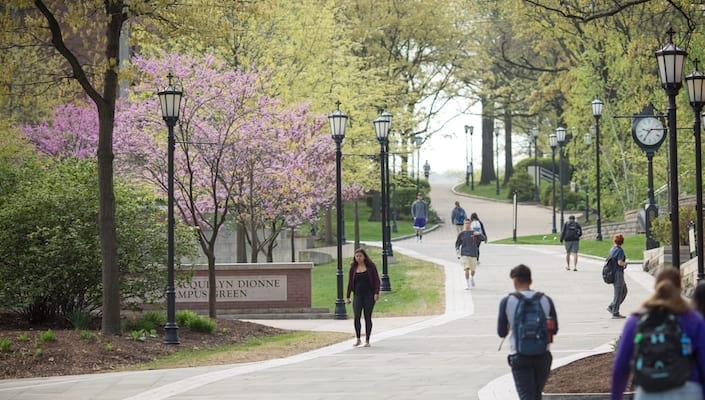 What someone can take from this experience is an opportunity to challenge themselves and better able to truly become “men and women for and with others,” the Ignatian value anyone at the University should have heard at least once. When going into this study abroad trip I had no real intention of challenging myself or and expectation that this would be an emotionally heavy trip. I simply took it because I thought it would be interesting to go to Jerusalem while getting credits toward my minor. My favorite part of the trip, other than the many kind and hospitable hosts and guides, was visiting St. Sabbas monastery. It was all I imagined a monastery would be. After visiting other monasteries and in the Holy Land, I had been left a little disappointed since they were more like visiting an attraction like the Niagara Falls. Right when you walk in you see a souvenir shop, then guides corralling 50 or so tourists/pilgrims. But St. Sabbas monastery was different. There was barely anyone there, and it was exclusive. I only managed to get in the front door because I was a man and because our professor was also Greek-Orthodox, and, even then, I only got onto a balcony right next to the front gate. Who would have thought that to be excluded I’d feel most special? It felt like somewhere special and not just an attraction. What I took away from this experience was to challenge biases and presuppositions. I won’t pretend to be an expert on the Middle East after just 10 days there, but I think now that at least in the case of the Palestinian I’d say hospitable. This is also what I took from this trip to challenge yourself to face your presuppositions, which can only be done when you are uncomfortable. To those interested in study abroad, I would say to just go for it. The process of applying is easy and it's at a pretty good price. Think of it this way where else can you get full room and board, food, transportation and knowledgeable guides for the same price. 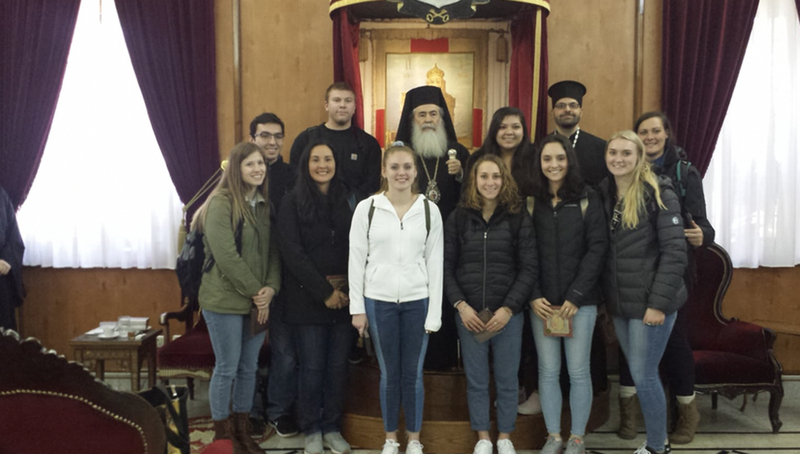 Batiz (far right) by Greek Orthodox church in Abud with guide Faraj (back left) and Instructor Fr. Azar (back Right). 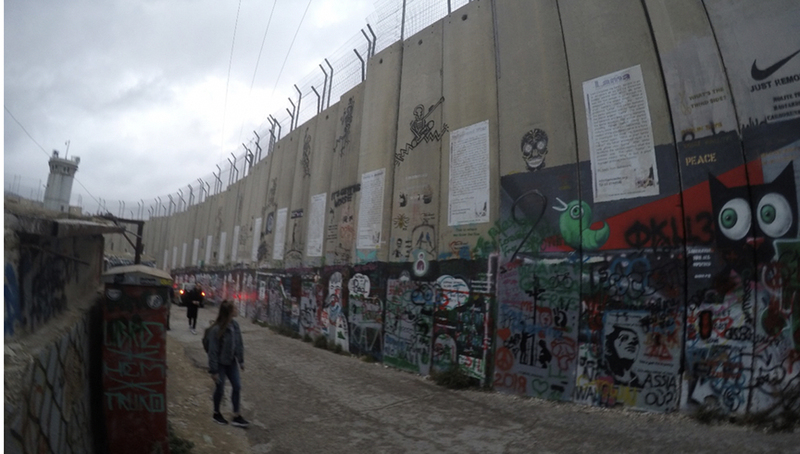 The Bethlehem separation/safety/apartheid wall separating Palestine from Israel. Batiz is a biology major with a minor in theology/religious studies.